The ever increasing demand for the business solutions are not met with the poor supply from the development sometimes. Therefore many companies tend to go with the no-code or less-code solutions and SharePoint has been a leader with many Out-of-the-box components. With the solid APIs build in around the services, Microsoft has enabled much better no-code implementations. Initially it came in with Windows App Studio where it allows you to create Windows Apps without any coding. Now its up for many services within the cloud and relevant API integrations with the name of PowerApps. 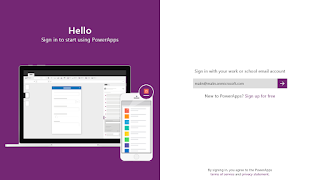 PowerApps allows you to create business apps without any code. The controls are just drag and drops and there are many types of services to choose from. You just need to have an organizational Microsoft account in order to Sign Up and can start by downloading the Windows Store App on your Windows machine.